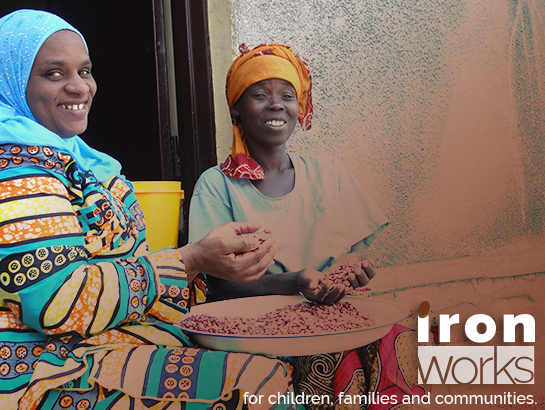 HarvestPlus has launched the Iron Works campaign, timed around International Women’s Day 2019, to raise awareness about #irondeficiency and how we are addressing it through nutritious biofortified foods in close collaboration with CGIAR centers, NARS, and many other partners. A multimedia digital feature on how HarvestPlus and its many partners within the CG system and beyond improve lives with Iron-Biofortified Crops. An infographic summarizing the problem and the biofortification solution. A toolkit for use on social media and elsewhere. A quiz to test one’s knowledge of iron deficiency. A recipe card for biofortified bean stew. There will be much more to come, including more recipe cards, videos, additional graphics, and several iron-focused stories from the field. Keep an eye on the HarvestPlus social media channels. Iron-biofortified crops are a practical, food-based option for resource-poor families and rural communities who rely on staple crops for much of their diet. For example, young children and non-pregnant, non-lactating women can get up to 80 percent of their daily average iron requirement by eating foods made with iron beans or iron pearl millet as a significant portion of their diet. Iron biofortification is helping rural families reach their cognitive and physical potential–one meal at a time.